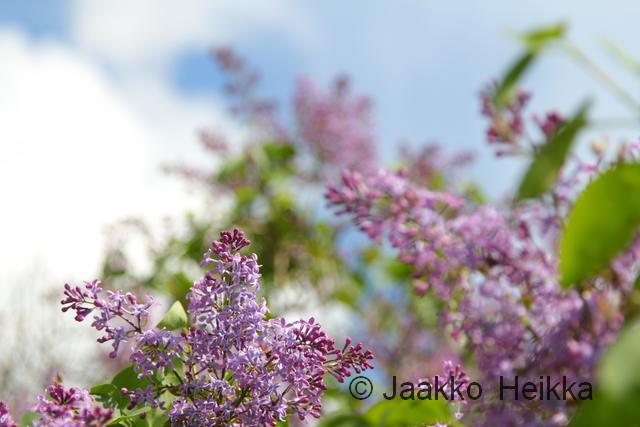 For the last two weeks or so it has been a full on summer here in Finland. Temperatures have been close to +30C, there hasn’t been much rain (at least in the South-East) and everything is green and blooming. Well, mosquitoes are not green but they seem to be booming as well… This all means it’s about the time to start summer outdoor activities and that’s what I did. Here’s a trip report from the season’s first kayaking trip. Usually I don’t do that much overnight trips, I prefer longer periods spend in more remote places than overnighters enable. But when the weather and company are good there’s absolutely no reason to turn down an overnighter. So I went for one, and later for another and now I’m planning a third one… But this post is about the season’s first overnighter. I haven’t been kayaking for a while. 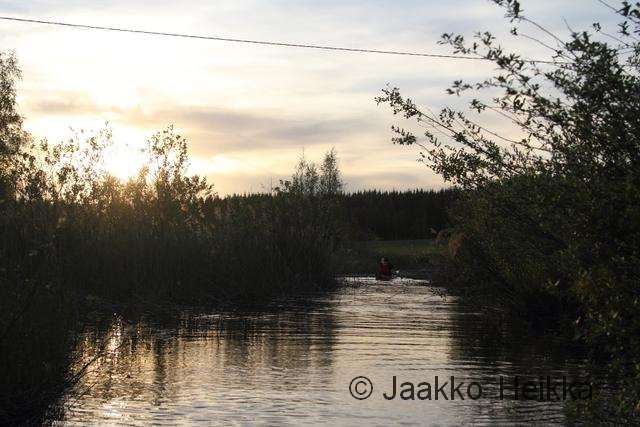 I actually like kayaking a lot and happen to be a qualified kayaking instructor and even live at the shore of the largest lake in Finland with little wild land but plenty of water… So I guess I should do more kayaking but as I have a packraft I can’t afford a kayak at the moment. But when a friend bought himself a kayak and asked me to join him for a test trip I decided quickly to rent one. 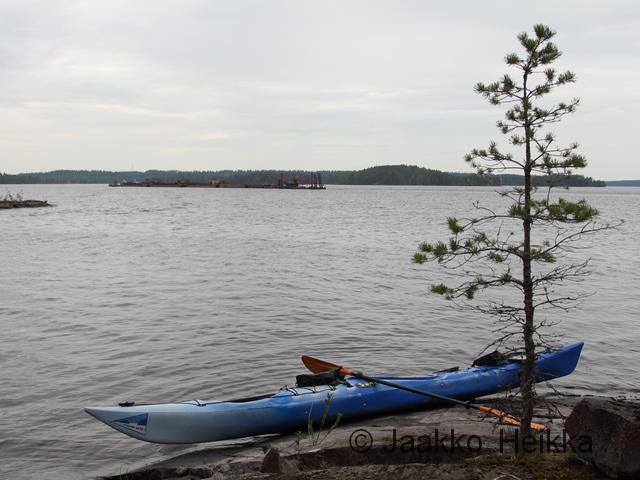 In addition to businesses, in Finland many clubs of Suomen Latu rent canoes, kayaks and equipment and also offer guiding services. 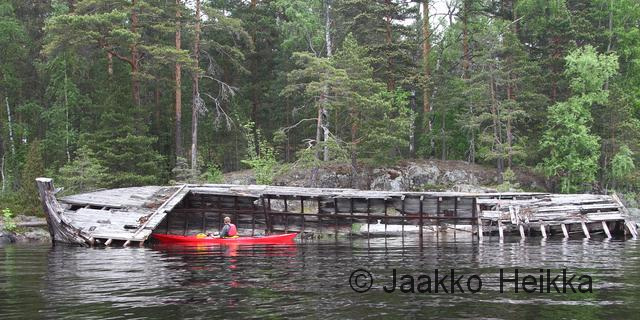 I rented the kayak from local Saimaan Latu. 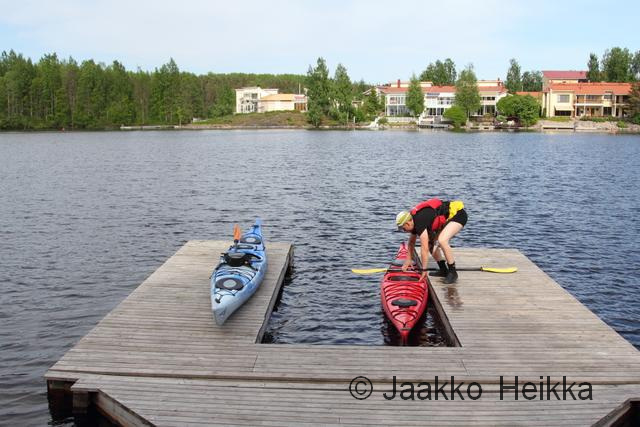 We started the trip from Myllysaari in Lappeenranta where I picked up the rental kayak from the club’s fine kayak shed. 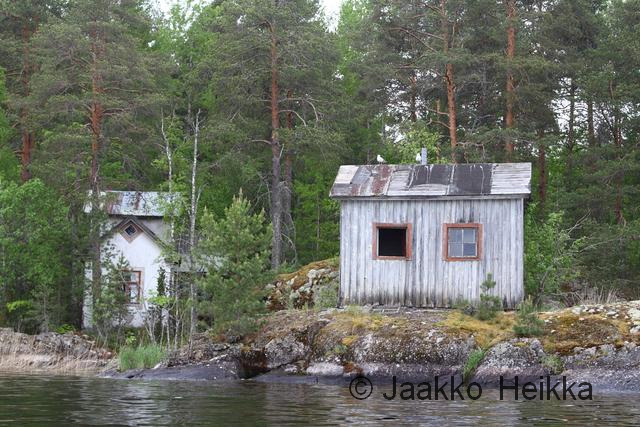 The plan was to circumnavigate a largish island called Kirkkosaari, spend a night in a shelter on the way and return back to Myllysaari the next day. We started late in the afternoon in good weather: warm, sunny but windy enough to keep it cool and add a little extra challenge for crossing the more exposed areas. 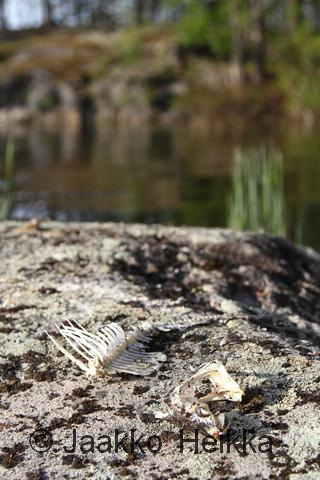 Water was probably around +18C so there was no need for a drysuit, which would’ve probably caused a heat stroke anyway. Short underwear, nice button-up shirt and cap was all that was needed – and of course a PFD. 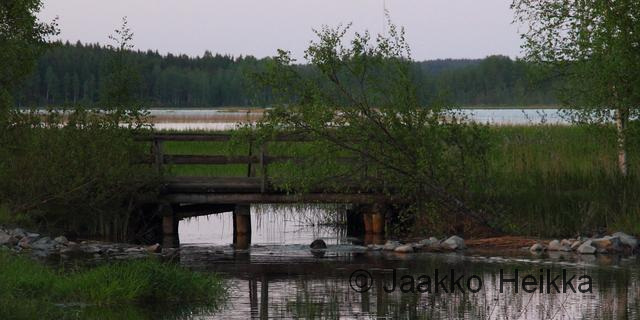 There were also nice shores without summer houses, with a wilderness like feeling. We paddled, paddled some more and then kept paddling. After some three hours in the boats we had very late lunch break on rocks sheltered behind a nice island. No bugs, no wind, warm sun shine. Could it get any better? The wind was slowly dying and the going was getting better with air cooling and lake calming down. After the break we soon reached the lean-to we had originally planned to use but decided to go for another hour as the conditions were so nice. 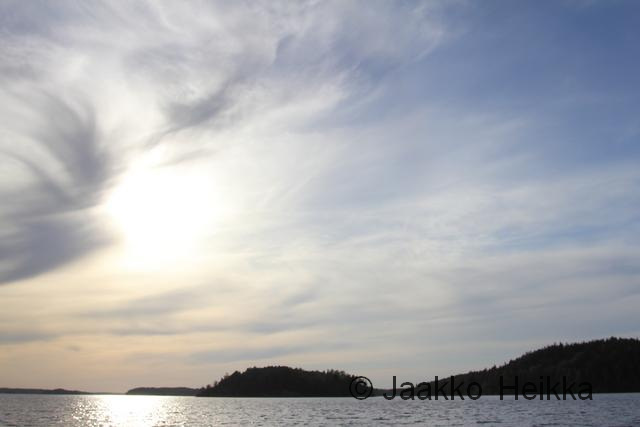 It was perfect on the lake: warm, sun low in the horizon, no wind, calm waters, tranquil atmosphere. I guess we could have kept paddling for quite a long time in the lovely conditions but we had agreed a meeting at the next lean-to. 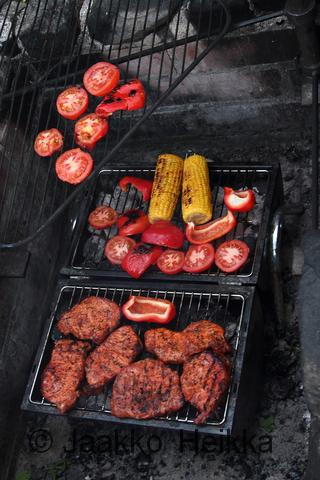 We had a problem as we wanted to have some quality grilled food but open fires were banned due the dryness and we couldn’t fit a proper barbecue in the kayaks… As a solution we called cavalry to the rescue – with a barbecue! After some 25km of kayaking we met N at a lean-to shelter easily accessible from a road. And she had brought barbecue with her! Evenings’ program was mostly grilling, eating and trying to not mind the mosquitoes. The lean-to is located in a nice spot on a riverside near the lake shore and the area was populated with birds and mosquitoes and we even saw a beaver in the river. Exploring the river upstream past the shelter. The big lump under the bridge is actually a beaver! 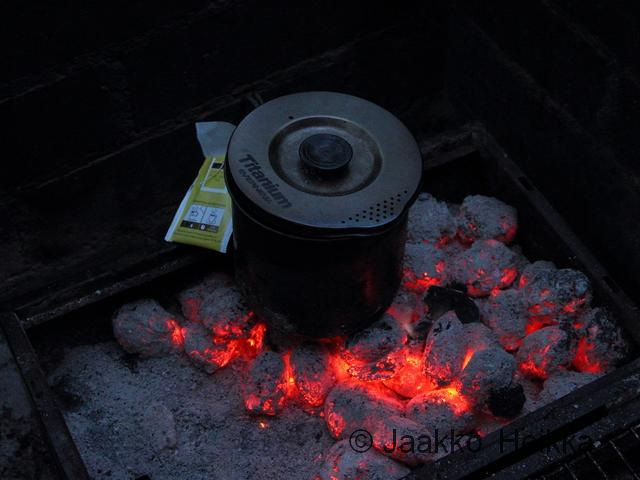 After breakfast and coffee cooked on Bush Buddy wood burning stove it was time to set on the waters again. The conditions weren’t bad but not as good as the previous evening: it was warm but cloudy, there was a headwind and forecast was threatening us with rain. The stiffness in my upper body reminded me that I hadn’t been kayaking for a while before yesterday but the headwind helped to warm up the sore muscles. Because of the headwind we decided to take some 5km shorter route and do a little portage. After a few hours we reached the portage in rain (Notice the photos missing as it was raining?) and easily carried our kayaks on the other side. Mosquitoes and rain didn’t encourage to have a longer pause so we just continued paddling untill the rain ended and we could have a lunch break on the waters without the bugs. Later we had a proper break on a small island enjoying snacks and watching train of barges sail past us. 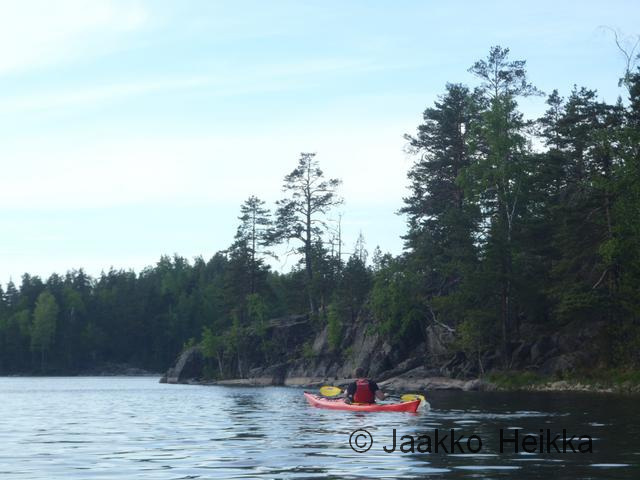 We paddled past islands crowded with summer houses of varying size and shape. The town silhoutte was visible in the horizon for the latter half of the day but it took some time to get there… As we closed the town and harbour area we zig zagged trough the archipelago and found an interesting shipwreck before finishing the trip. The second day turned out to be some 27km and took little under six hours with breaks. 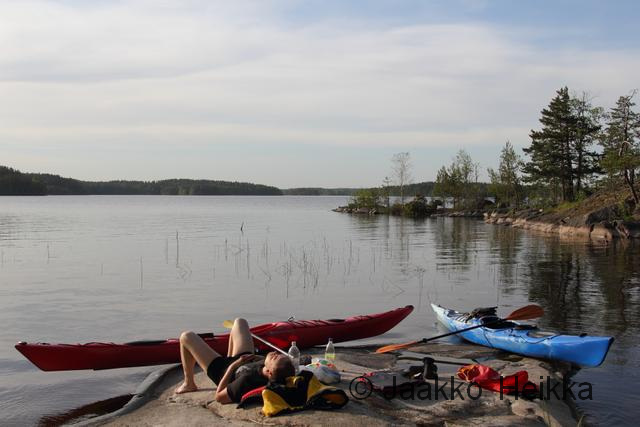 The trip reminded me that it would make a lot sense to own a kayak when living next to lake Saimaa but I guess I’ll stick with the rentals for now but I’ll be definitely kayaking more this summer! We don’t get them where I live but they are bad in Scotland, I’ve even heard of people putting women’s tights over their heads for protection!